Cactus Image, the Hong Kong photographic accessory manufacturer, has announced a new firmware update to its V6 II and V6 IIs flash triggers. With the latest version, the triggers — which already supported cross-brand high-speed sync — will offer automatic TTL exposure between flash and camera brands. The new “X-TTL” support means you can mix and match (almost) any camera and flash and still get TTL flash control. Supported brands include Canon, Fujifilm, Nikon, Olympus, Panasonic, Pentax and Sigma. The initial wave of firmware updates are specific to Sigma, Sony and Fujifilm-fit triggers, but the remainder will roll out later. Also new in this announcement is support for Sigma cameras and flashes, including remote power and zoom control, high-speed sync and wireless TTL support with Sigma’s SA-TTL flashes. Fujfilm now gets high-speed sync support for the EF-X500, the brand’s first flash with HSS. Using the V6 II transmitter, one can adjust TTL ratios and wireless groups directly from the camera position. TTL flashes can be used either on or off-camera, thanks to universal hotshoes and TTL pass-through. The V6 IIs is a special version of the V6 II that fits Sony’s not-quite-standard Multi-Interface Hotshoe. Handy features of the V6 II and “X-TTL” system include “Flash Power Lock” — which remembers and locks the exact flash output from a TTL exposure — for consistent, repeatable results. The “Flash Compensate” feature adds to this, by fixing the flash exposure but automatically adjusting output to keep it constant when camera settings change. The triggers are directly compatible with Cactus’s own RF60X flashgun, which supports HSS, TTL and remote power and zoom control. Cross-brand TTL and HSS has some limitations: Pentax and Sony flashes can only use HSS when triggered by the same brand cameras (but Pentax and Sony cameras can trigger Canon, Nikon, Olympus and Panasonic flashes). Only Canon, Nikon, Olympus and Panasonic system flashes support cross-brand TTL. The new firmware updates are free to download, when available, from the Cactus Image web site. 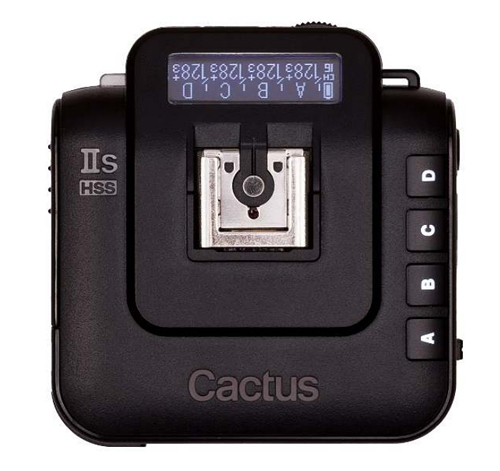 The Cactus V6 II and V6 IIs are priced $95 per transceiver, available from Adorama, B&H Photo, eBay and other retailers.